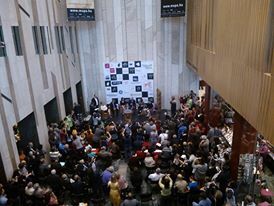 Today was a big day for chess culture in Budapest. 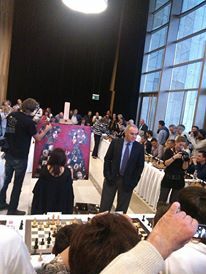 The annual Polgar sisters-Aquaprofit chess festival took place, featuring all three Polgar sisters and special guest, Ex-World Champion Kasparov. 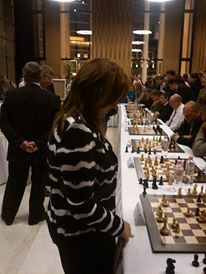 I managed to see the tail-end of the event and witnessed Judit’s simul. Here are some pictures by Eniko Szakacs(big thanks!). Sulcz and Orfei are in the overall lead with 4/4 while I am in second with 3.5/4. Orfei is playing some strong and consistent chess for a well-earned share of the lead. I played a nice game to win in rd4 but I should also have won in rd4 but I could not find the correct tactical solution(s) when needed and then seeing my brain was not cooperating, I took a draw offer in a complex R-R ending. Black won material with 28..g5! which removes a key defender of Re2 to make e-file tactics work. I had to find 18.Bxf5 which I did calculate but I thought I was losing my queen. But this was correct as white eventually breaks through on g7. In the game I played cautiously with 18.Ke1 and missed another later win. Now black turned the game with the nasty 23..Nxd4! and white was in big trouble. Sulcz and Orfei are in the overall lead with 4/4 while I am in second with 3.5/4. I must take a bye in rd5 so effectively, I am out of the race. 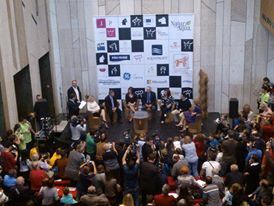 On one day of each year the legendary sisters of chess, living in three different continents of the world, join together to promote the game of chess in a very inspirational and entertaining way. 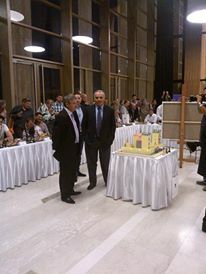 in 2007, there came the idea of having a reunion, a big celebration of chess, serving a good cause and that way also finding the opportunity to join their lives again through chess.The Polgar Chess Festival has firmly established itself as a very prestigious social event, where celebrities, athletes, artists, scientists, businessmen, politicians and most importantly children like to participate and have fun for an entire day. 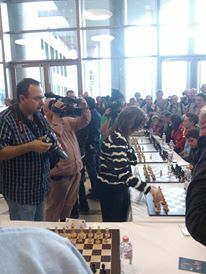 In 2012 The EU Youth Talents vs Judit Polgar simultaneous exhibition game was one of the major events on the festival, where the world’s N°1 female chess player, as an ambassador of Chess in School program adopted by the European Parliament, gave a 27-board simul to children representing the 27 nations of the EU. Here is a shortened version of a great post. This starts with teaching children the rules, notation and so on, then goes on to teaching them basic strategic concepts, such as development, king safety, the value of the pieces. The junior trainer will often go through games with a group of children, discussing ideas, telling them when to look out for simple opportunities and so on. In this phase of the talent’s development the trainer is likely to still be a stronger player, at least for a part of the process. He is able to show the talent a lot of ideas and typical patterns, structures, combinations and so on. At the same time he will also be able to help the talent prepare for games, analyse his games with him and choose what books he needs to read, which types of exercises he should solve and so on. This is the standard trainer you can find online. Once a player reaches a certain level he will start to play in tense competitive situations. This can be national championships, international championships or even matches. I think most players over 2400 would benefit a lot from a second, but with the low amount of money in prizes at “normal” tournaments, only players at the top or participants in junior championships usually have access to a second. The final category is the one I have moved into over the last decade, by natural progression. 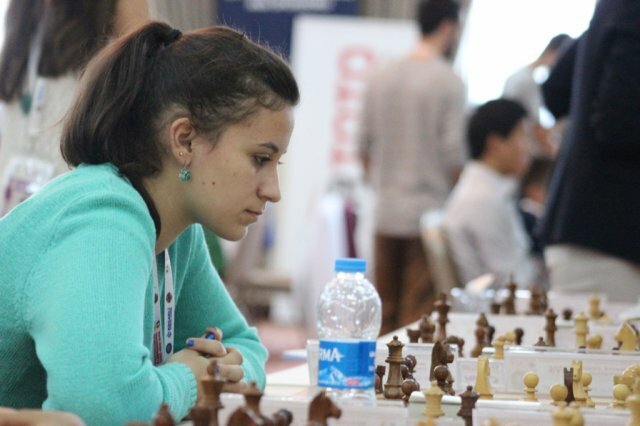 In the Girls section WGM Bulmaga Irina of Roumania defeated Top Seed Alina Kashlinskaya to take her score to 7.5 points and become the sole leader, half a point ahead of Russian WGM Aleksandra Goryachkina. Indian Girls played miserably with Only Ivana Maria Furtado winning her Game. WGM Padmini Rout drew her game and with 6.5 points slipped to 6th position. Rucha Pujari also drew and is on 5 points. Rest of the Indian Girls lost their games. Versenyzési és értékszám szerzési lehetőséget biztosítani a HÓBAGOLY SE és más egyesületek 2200 FIDE Élő pont alatti sakkozói részére, megemlékezni egyesületünk alapítójáról. IM To has a perfect 2/2 in the strong top group. Varga continues his strong results this year and has 1.5/2. Young Erik Frik Furedi shares the lead with 1.5/2 together with three others. GMs YU, YANGYI and IPATOV, ALEXANDER share the lead with 7/8. IM NAGY GABOR and FM ANTAL TIBOR have 4/8. WFM JUHASZ BARBARA has 4/8 in the Girls Ch. ‘Top Seed Chinese Grandmaster Yu Yang Yi drew his game while GM Alexander Ipatov Defeated Indian Grrandmaster S P Sethuraman to take his score to 7 points to jointly lead the championship with Yang Yi. A point behind the joint leader are as many as 5 players.GM Vidit Santosh Gujarathi and S L Narayanan won their games. GM Sahej Grover and Narayanan Srinath drew their games. are now on 6.5 points from 6 games and are jointly leading the championship. I won a tense game after many mutual errors. My opponent missed a good chance with 35.Rxf7! and played 35.Bf2 instead. After 35..Nxg3, now white played 36.Rxf7? but the idea does not work as on 36..Rxf7 37.Bxd5 I had 37..Ne2+! and black keeps the extra pawn. Orfei won on board 2 beside me with a Vienna game in fine attacking style as the leaders continued to win as expected. Hegedus upset Liptak on board 4 while Czimer also upset Szendeff on board 5 but the rating differences have much less significance in these small opens as anyone can beat anyone on any given day. I played like a dunce and won from a lost position in my first game. The round 2 pairings are set and I will play someone who beat me in the last Torokves Open. The top 4 players usually play in the RR group but I have switched to playing in the more casual Open. From my last experience, the games are not really easier but the atmosphere is more relaxing. Orfei won from the black side of an Exchange King's Indian on the board beside me. He did have time to give me an odd look after seeing my position on the verge of doom.